For the spicy dipping sauce simply mix together the 3 ingredients and set aside. Heat up about 2 cups of oil in a medium saucepan over medium heat. While the oil is heating mix together the flour, beer, garlic powder, salt and pepper. To test to see if the oil is ready carefully drop in a drop of the batter. If bubbles gently form around it then the oil is ready. If the batter drops to the bottom its too cool yet and if it starts splattering everywhere then you are too hot. One at a time dip the curds into the batter and gently place them into the oil. Do only about 5 or 6 at a tim, you don't want to overcrowd the pan or to have them stick together. Using a slotted spoon gently move the curds around in the oil to ensure they brown up evenly. They cook up really quickly so about 30 seconds in the oil and they are done. Place onto a paper toweled plate to absorb any excess oil. Continue until all the curds are cooked. These curds are so so so good!!! The batter is really light thanks to the bubbly beer, they are quickly fried and the cheese is just perfectly melted inside! 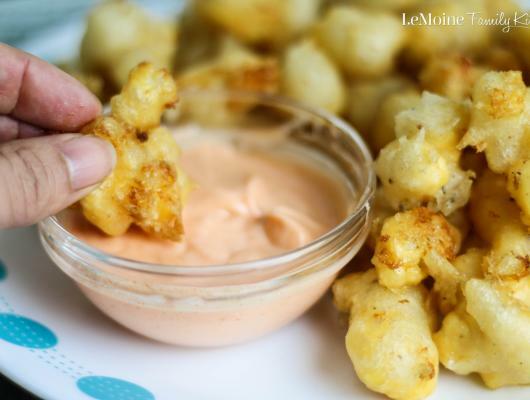 I made a really quick and simple dipping sauce to go along with the curds, mayo, Franks Red Hot and a little garlic powder. 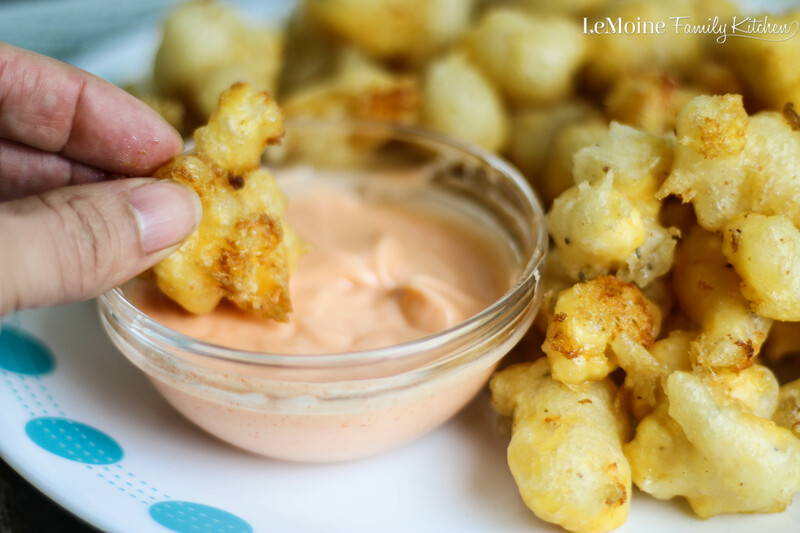 Self control needs to come into play here because you can’t just pop 5 of these Beer Battered Cheese Curds!